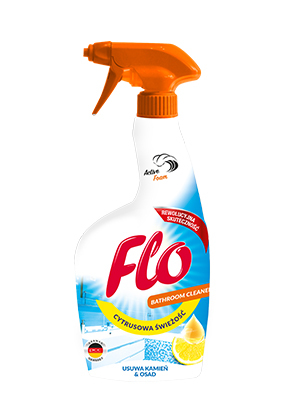 Flo Bathroom Cleaner is a modern spray formulation for cleaning washable surfaces in the bathroom. It is extremely effective and convenient to use. Thanks to a special Pro Active formula it creates an active foam that stays longer on the cleaned surface and dissolves dirt, restoring shine to the cleaned surfaces. The product effectively removes limescale and soap deposits. It is intended for cleaning bathroom fittings, showers, bathtubs and stainless steel faucets. In spite of its strength, it remains gentle on cleaned surfaces, leaving no streaks or scratches on them. Flo Bathroom Cleaner leaves a pleasant, fresh, citrus scent, thanks to which the bathroom smells clean. The product does not contain phosphates. The product has been manufactured on modern installations covered by the integrated quality and environmental management system ISO 9001 and ISO 14001. Directions for use: spray the cleaned surface and leave for 1 minute, then wipe with a sponge or brush. After using the liquid, rinse the surface with water. Recommendations: Preparation for direct use. Intended for everyday cleaning of bathrooms and sanitary facilities. Recommended for bathroom fittings, showers, enamel, acrylic, ceramic and porcelain baths. Do not use on surfaces sensitive to acids such as aluminum, zinced metals, tiles, terracotta. The product is suitable for cleaning surfaces resistant to acids. Do not mix with agents containing chlorine. Note: Irritating to eyes. cleaning enamel, acrylic, ceramic and porcelain baths.